The course is for those who would like to let their natural beauty shine and turn back the clock looking and feeling 10 or more years younger. Age-reversal tips and tricks; sacred geometry of the human body; secrets of the face; fun anti-aging exercises; and, of course, effective SCENAR protocols and techniques for aestetics and vitality (17 in total), including the famous „Cinderella Beauty Treatment“. 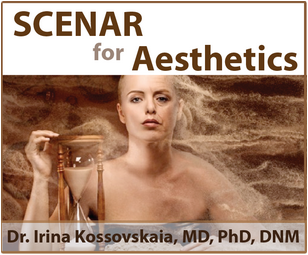 All these in the „SCENAR and AESTHETICS“ course. You need to be a SCENAR Practitioner owing a Professional SCENAR device and some shungitte/stainless steel attachments – Y-probe, Mini-spheres/Dual Pole, Flat disks/Double Bell electrodes and an ULM Energy Blanket so that your clients fully benefit from the beauty protocols. The course will generally take about 2 hours to complete. You also receive unlimited access and number of logins to your course and the resource material within one year of your subscription.